Ischemic abducens nerve palsy usually presents as isolated cranial nerve palsy in the middle aged and elderly patients with known risk factors such as diabetes mellitus, hypertension, dyslipidemia, carotid artery disease, etc., In this report, we describe four patients with isolated abducens nerve palsy who presented with an acute onset diplopia whose detailed history and examination were suggestive of an ischemic etiology. Detailed systemic and laboratory evaluation revealed hyperhomocysteinemia as the only potential risk factor. To the best of our knowledge this is the first report of association of hyperhomocysteinemia and isolated abducens nerve palsy. Isolated abducens nerve palsy is the most common form of cranial nerve palsies encountered in neuro-ophthalmology clinics and may be idiopathic or due to head trauma, intracranial space occupying lesions, vascular diseases, inflammatory conditions (postviral fever, postinfectious, post-vaccinial) or demyelinating disorders in young patients (<50 years). Hyperhomocysteinemia has been reported as an independent risk factor for systemic and ocular vaso-occlusive disorders, especially in young patients. ,, In this case series, we describe four patients with isolated abducens nerve palsy where hyperhomocysteinemia was the sole risk factor. Between November 2008 and October 2010, 27 patients with isolated abducens nerve palsy presented to our clinics. All of these patients underwent evaluation for potential predisposing factors like viral fever, trauma, diabetes, hypertension, collagen vascular disorders, and dyslipidemia. Serum homocysteine levels were determined in those patients without any obvious history of ocular trauma, with or without presence of other risk factors like diabetes, hypertension, and dyslipidemia. Our series comprises of four patients who were found to have hyperhomocysteinemia as the sole risk factor. Three patients were female and one was male. Details of the cases are shown in [Table 1]. The mean age of patients was 25 years (range: 6-52 years). All patients presented with complaints of double vision and mean duration of symptoms was 29 days (range: 3-90 days). All patients had a -4 to -3 limitation of abduction where -4 limitation implied no movement of the eyeball beyond the midline and -1 limitation of abduction referred to limitation of abduction only in extreme abduction. The mean amount of esotropia [Table 1] in primary gaze was 20 prism diopters (range: 12-30 PD, standard deviation (SD) =7.48 PD). Greatest deviation was noted in direction of limitation of movement [Figure 1]a. Anterior segment and fundus examination was unremarkable. All patients underwent magnetic resonance imaging (MRI) brain with contrast [Figure 2] which showed only the presence of ischemic lesions in two patients [Table 1]. The erythrocyte sedimentation rate (ESR), C-reactive protein, lipid profile, blood glucose levels, blood pressure, echocardiogram, and carotid Doppler were normal for all patients. However, all patients were found to have elevated serum homocysteine. Mean serum homocysteine level was 19.20 μmol/L (range: 16.07-20.50, SD: 2.09 μmol/L, normal: 3.9-13.9 μmol/L, chemiluminescence method). The patients were treated with vitamins B6 (250 mg), B12 (1,500 μg), and folic acid (5 mg). Two patients were given injection botulinum toxin (BOTOX, Allergan, 2.5 IU) in the medial rectus muscle of the affected eye to relieve diplopia while the other two were observed. After 2 months, all patients showed complete resolution with orthotropia in primary gaze and complete recovery of extraocular motility [Figure 1]b. Similar to the previous reports, patients in our series were young with a mean age of 25 years (range: 6-52 years). In our series, all patients presented with isolated abducens nerve palsy without any other known risk factor apart from hyperhomocysteinemia. The presence of the ischemic lesions on MRI in two patients prompted us to think of hyperhomocysteinemia as a possible risk factor. 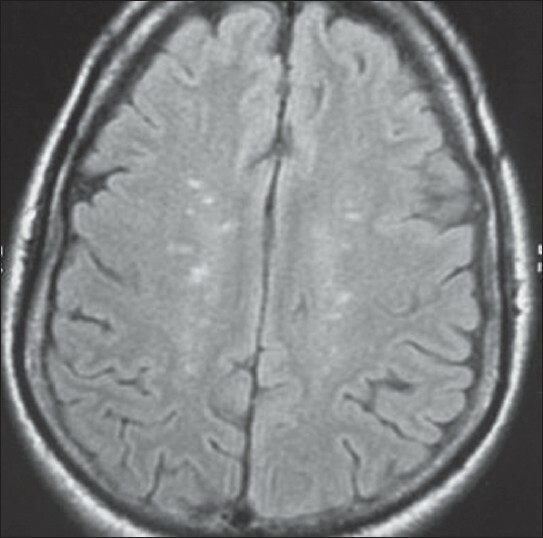 Since we found elevated homocysteine levels in these patients, we investigated for hyperhomocysteinemia in the other patients as well, despite a normal neuroimaging. Abducens nerve involvement in these cases could be attributed to microvasculopathy induced damage similar to that found in diabetic patients with abducens palsy. Hyperhomocysteinemia is a potentially modifiable risk factor. Dietary supplementation of 250 mg of vitamin B 6 , 5 mg of folic acid and vitamin B 12 daily has been shown to lower serum homocysteine levels. Complete resolution, either spontaneous or following single botulinum injection and oral vitamin supplementation, was noted in all patients as is seen in patients with microvasculopathy as seen in diabetes mellitus. Although hyperhomocysteinemia has been reported with various vaso-occlusive diseases; however, causal association is still not proven. Population based randomized trials such as CARDIOVIT study,  are underway to investigate the association of hyperhomocysteinemia with systemic vaso-occlusive diseases. Until conclusive data is available it is recommended to investigate and treat for hyperhomocysteinemia in cases of vaso-occlusive diseases. The main limitation of our series is its retrospective nature with limited size. However, this is an uncommon condition and to the best of our knowledge, this is the first reported association of hyperhomocysteinemia with isolated cranial nerve palsy. Based on our findings we recommend estimation of serum homocysteine in the work up of young patients with nontraumatic isolated abducens nerve palsy in the absence of other risk factors. We acknowledge the support of Dr. Merle Fernandes, Director and Consultant, Cornea and Anterior segment services in the English language editing for the manuscript. Menon V, Singh J, Prakash P. Etiological patterns of ocular motor nerve palsies. Indian J Ophthalmol 1984;32:447-53. Pianka P, Almog Y, Man O, Goldstein M, Sela BA, Loewenstein A. Hyperhomocysteinemia in patients with nonarteritic anterior ischemic optic neuropathy, central retinal artery occlusion, and central retinal vein occlusion. Ophthalmology 2000;107:1588-92. Kawasaki A, Purvin VA, Burgett RA. Hyperhomocysteinemia in young patients with non-arteritic anterior ischaemic optic neuropathy. Br J Ophthalmol 1999;83:1287-90. Ravi C, Ramesha K, Sachdeva V, Pathengay A, Rao BV. A case of presumed association of Hyperhomocysteinemia-with NAION and Cilioretinal artery obstruction. Asian J Ophthalmol 2009;11:32-4. Kalita J, Kumar G, Bansal V, Misra UK. Relationship of homocysteine with other risk factors and outcome of ischemic stroke. Clin Neurol Neurosurg 2009;111:364-7. Shenoy KT, Lena KS, Sali N, Syam S, Shenoy ST, Rajadhyaksha VD, et al. Cardiovit Study Team. Rationale and design for the CARDIOVIT study (Cardiovit Atherosclerotic vascular Disease and hypeRhomocysteinemia: An epidemiological study in Indians, additionally evaluating the effect of Oral VITamin supplementation). Curr Med Res Opin 2006;22:641-8.